It has been said that approximately 1/4 of the text messages sent by teens is sent during the school day. a.) Why do you think so many teens texting through the school day? b.) Why do you think teens text instead of having face to face talks? c.) Does texting not distract from school achievement? Why or why not? messages over real time discussions? 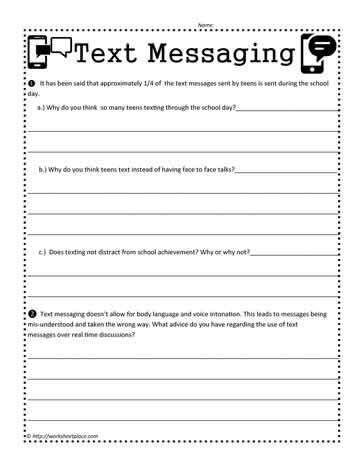 A great text messaging worksheet for middle grade students.